Because Jason is from Texas, where there are no doubt 1979 Corvairs or Pintos or Mustangs up on blocks with abundance, he gets to call the below arrangement “putting chickens on blocks” for the winter. What it really means is, that the weather in Seattle is too cold for the chickens to dig up the lawn with any hope of the lawn redeeming itself, and the nightime temperatures are getting close enough to freezing that the possibility of snow is getting more likely. Snow isn’t that common in Seattle proper, but it does shut down the city, and the chickens complain no end when it does happen. 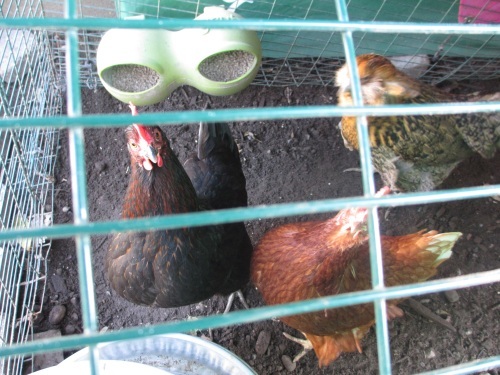 The chickens of course don’t understand why they are being confined to one spot in the yard under the deck. And they give us the beady eye. Especially bossy. Temperatures closer to freezing also mean we finally enter the ritual days of shutting the coop door at night and having to let the chickens out in the morning. 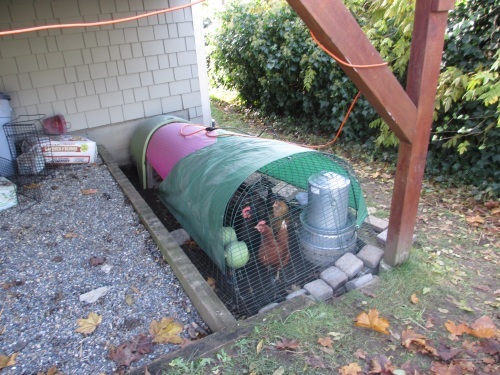 For folks who build their own coop, or have a large building as a coop this isn’t a big deal. 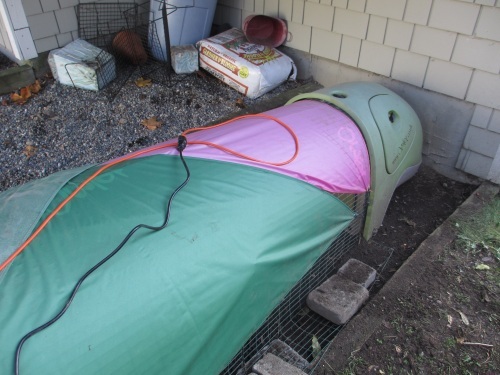 For those of us with the Eglu from Omelet, it’s a really important thing to remember letting the chickens out each morning – they will die of dehydration else. The other thing you will see in these photos – besides creative use of the skimpier tarps the Omlet folk offer for sale – is a lot of power cords. It’s not that exciting and we don’t “heat the outside” – but we do try to put a heating element (aquarium light I think is the techincal term) in the water dish so that the water isn’t frozen. 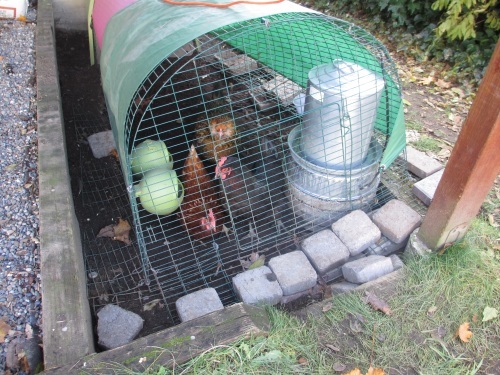 Chickens can dehydrate outside the coop too if their water is frozen. I’ve been reading around and tried to share the tidbits about winter and lights that other agricultural extension and professionals talk about, but this is what we do and so far the chickens have lived. It helps we have a milder climate here in Seattle than other places. Oh yes – the egg production for us (since we don’t apply lights to keep the hens producing) has gone to the point we need to buy eggs at the store now. Sad, but true. Winter is the time of Yuppie egg spending for us – we’ve been spoiled in our omega egg hen production in the summer and now we must pay to support that lifestyle!